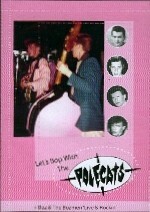 Produktinformationen "POLECATS - Let`s Bop With The Polecats DVD"
'Let's Bop With The Polecats!' is the first ever DVD release from the most energetic and colourful band of the 1980's Rockabilly revival. The Polecats signed a major-label deal which led to international success and hits singles 'Rockabilly Guy', 'John I'm Only Dancing', 'Jeepster' and 'Make A Circuit With Me'. Their Dave Edmunds produced album 'Polecats Are Go!' is regarded as a classic of the genre. But the Polecats were are the wildest live on stage, as this 1981 performance shows. A storming 1988 show from guitarist Boz Boorer's post-Polecats project Boz & The Bozmen is included as a bonus programme. Boorer teams up with other well-known faces from the 80's Rockabilly scene to form the first Rockabilly Supergroup. Track listing: THE POLECATS: We Say Yeah ~ Jeepster ~ Let's Bop ~ Red Ready Amber ~ Running Back ~ Little Pig ~ I'll Cry Instead ~ Rockabilly Guy ~ Cotton Pickin' Rocker ~ Big Green Car ~ Bang Bang. BOZ & THE BOZMEN: Shake 'Em Up Rock ~ Midnight Shift ~ Red Ready Amber ~ Catch On ~ Rockin' Shoes ~ Run Run Rudolph ~ Everybody's Rockin' ~ Mars & Jupiter Stomp ~ Rock Billy Boogie. Weiterführende Links zu "POLECATS - Let`s Bop With The Polecats DVD"